"Community" is a basic concept, perhaps the basic concept, in social science and in social philosophy. Its meanings are many and varied, yet it is pre-eminent in discussions of man and his world. The editors of this book have selected material from many sources in an attempt to explore the meaning and relevance of the idea of community as it is used in social science, political commentary, and general literature. The book is organized around four basic problems: What aspect of social life is community? What is the character of community in different settings? What is the relationship of politics to community? What is the prospect for community in today's changing world? To answer these questions, the editors have drawn from historical and contemporary sources in political philosophy, empirical social science, anthropology, sociology, history, political science, and ancient and modern literature (e.g., Isaac Bashevis Singer, C. P. Snow, Lawrence Durrell, and others)--all reflecting a broad spectrum of attitudes and approaches. Community is considered in both Western and non-Western societies. The editors introduce each chapter of the book with a critique and provide the reader with an informed general commentary. 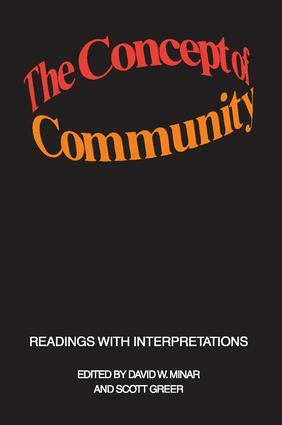 Including some of the classic statements on the meaning and importance of "community" while drawing upon new sources of insight, this book supplements courses relating to this central concept. Emphasizing the idea of community as an aspect of social organization and political life, it is especially useful in political science and sociology courses dealing with local politics and the urban world.